The sounds of passionate voices filled the air Tuesday evening in Norman Bethune Square in downtown Montreal. Approximately 100 people gathered with candles and signs in hand, some faces expressing confusion and despair. 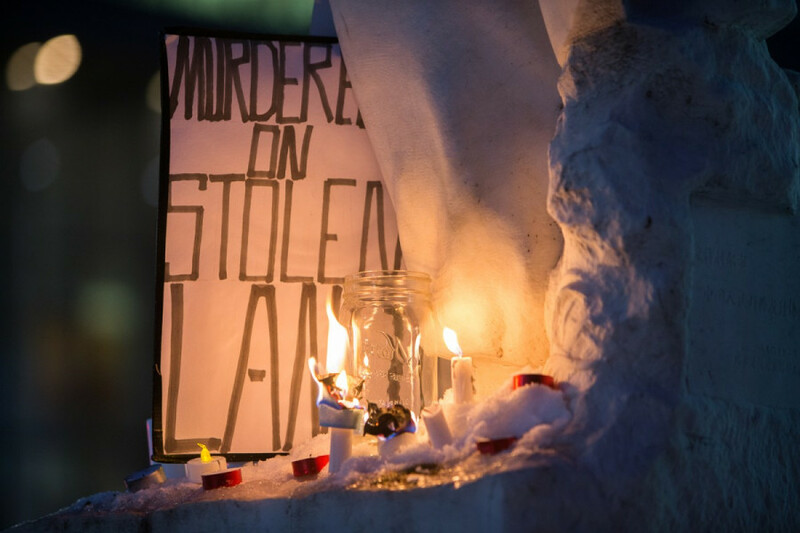 The vigil was held in commemoration of the late Colten Boushie, a 22-year-old Cree man from the Red Pheasant First Nation in Saskatchewan who was killed in 2016. Boushie was shot in the head by Gerald Stanley, a farmer in Saskatchewan. On Feb. 9, Stanley was acquitted of manslaughter and second-degree murder charges by an all-white jury. “I’m really blown away by this one,” said Vicky Boldo, co-chair of the Montreal Urban Aboriginal Community Strategy Network and an elder with the Aboriginal Student Resource Centre at Concordia, in response to the acquittal. Nakuset, the executive director of the Native Women’s Shelter in Montreal, said she’s in contact with a friend in Saskatchewan who said racist attitudes have intensified further in light of Boushie’s death. Nakuset also read a statement from Boushie’s family. “We will continue to speak out and call for justice in Colten’s name. We will fight for an appeal and for answers to all of the racism that we experienced as a family. From the day that he was shot, to the moment the jury read the verdict not guilty. We will not stop in our pursuit of justice,” Nakuset read. 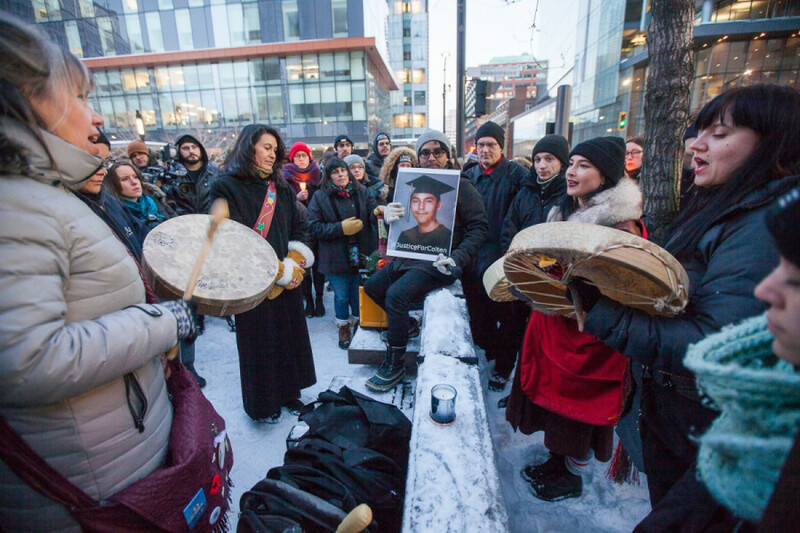 With the statement, the family expressed gratitude for the support people have shown across the country within holding vigils in solidarity with Boushie and his family. Following the reading of the statement and Nakuset’s speech, a small group practiced drumming and traditional Indigenous throat singing, as the crowd silently listened. “What we need is systemic change,” said Ellen Gabriel, an activist for Mohawk people who was active during the 1990 Oka Crisis—she was chosen to be the spokesperson during the crisis by her community of Kanehsatà:ke and the People of the Longhouse. “All we need is for people to feel real reconciliation—without the money, without the funding—and to understand that this young man’s life was taken unjustly,” said Gabriel. 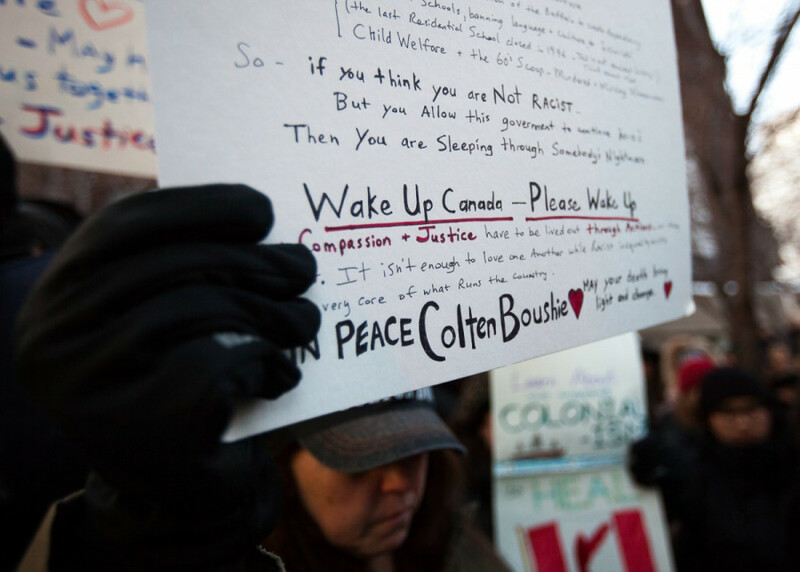 “Every time an Indigenous person goes murdered or missing, whether they are a woman or a man, we are automatically assumed to be the criminals as Colten Boushie’s parents were,” she said. 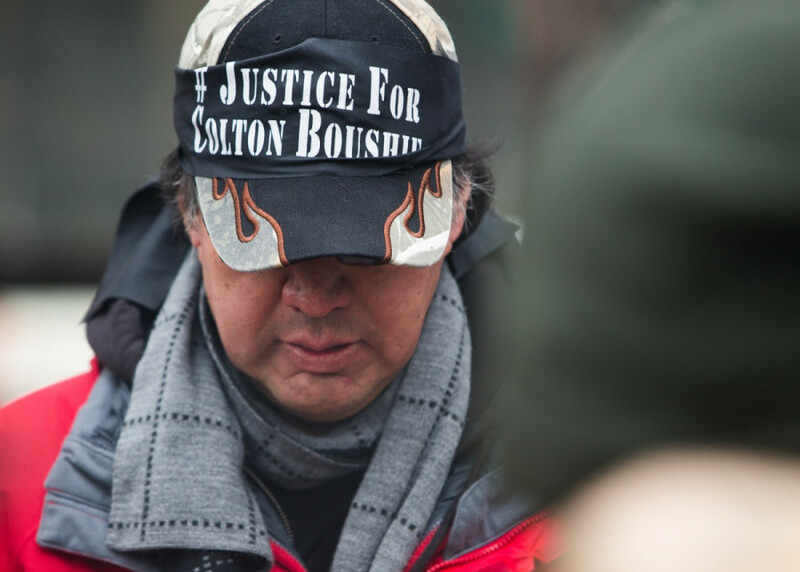 Gabriel recounted that when the police came to declare the death of Colten Boushie to his family, authorities entered the family’s home without a warrant and asked if they were drunk when the family had just lost their son. “How many other families are wallowing in the darkness of Canada’s justice system because of race, because of who they are, because of their gender?” said Gabriel. Talia Bellerose, a speaker at the event and Concordia student in First Peoples Studies, said it’s important for people to educate themselves on Canada’s history. “Just because your not apart of [the issue of racism] doesn’t mean it won’t go away,” Bellerose said. Dexter Xurukulasuriya planned outreach for the event online, said that community members can help by educating themselves on First Peoples perspectives by taking courses in First Peoples Studies . Before concluding the vigil, Nakuset encourages Indigenous people who have experienced or witnessed encounters including racism with those in the public service, such as encounters with police officers, to speak at the Viens commission. The commission has been touring various Indigenous communities province-wide in a public inquiry in which they are assessing the treatment of Indigenous people by those working in public services in Quebec, including police officers, according to the CBC. The commission began hearings on Monday and will be in Montreal for two weeks.